Smile Makers provides ClearCorrect in Montgomery, AL. Call 334-239-2346 to learn more and schedule your appointment. Metal braces were long considered the treatment of choice for straightening teeth. Today, though, there is an alternative. ClearCorrect can treat the same orthodontic issues as braces, including crooked teeth, overbites, and cross bites, without the drawbacks. ClearCorrect uses a series of custom-made, clear plastic aligners to gently straighten teeth. Comfortable and removable, the aligners are changed at home rather than adjusted in the dentist’s office. In fact, most people using ClearCorrect only to need to see the dentist once every four to six weeks. With metal braces, you will have to guess what your finished smile will look like. With ClearCorrect, the first step is to create a 3-D model of your current smile, and then morph it to show you the expected results from every stage of treatment, including the last. In addition, since the aligners are clear, and you will change them at home, you can watch the progression of your smile in real time. If you choose metal braces, they will be entirely under your dentist’s control. He or she will place them, adjust them, and remove them at the end of treatment. If you have an emergency such as a popped wire, you will go to the dentist for help. In addition, you will not be able to eat certain foods that are likely to get stuck in the brackets and wires, and brushing your teeth can be an exercise in frustration. 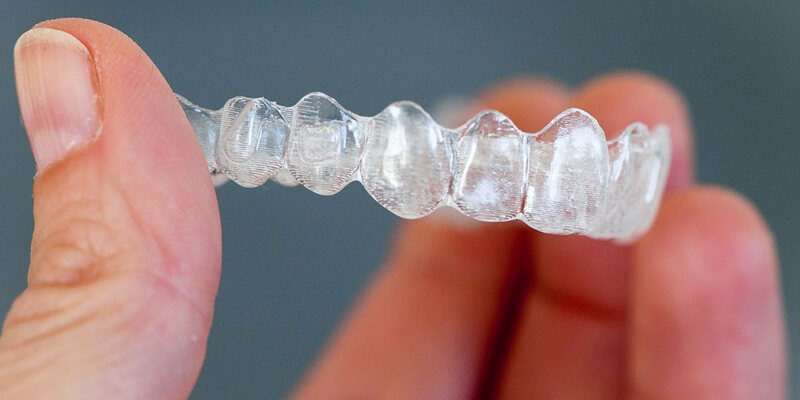 Invisalign is under your control. Your dentist will place the attachments on your teeth and help you put in the first aligner. Every two weeks or as directed, you will put in a new aligner at home. Since ClearCorrect is removable, if you want to eat sticky candy or popcorn, you can simply pop out the aligner, have a snack, and then brush your teeth and put the aligner back in. Oral hygiene is also far easier, since you can simply remove the aligner to brush and floss as normal. Many people assume that ClearCorrect is more expensive than braces. However, this is becoming less and less true. Add-ons such as colored brackets can raise the cost of braces, as can adjustments and emergency visits. ClearCorrect uses transparent pricing. Talk to our office staff to learn whether this treatment is covered and what your out of pockets costs will be. Braces can be uncomfortable, scratching the tissues of your mouth and tongue. Having them adjusted can actually be painful. ClearCorrect aligners are made of smooth, comfortable plastic with nothing to catch on the tissues. The aligners gently shift the teeth, minimizing pain. ClearCorrect is also the more aesthetic choice. Whether you are going for a big promotion or your teen is having senior pictures made, no one likes to show off a mouth full of metal. Call 334-239-2346 to schedule your appointment.